Hello, and welcome back to our blog! 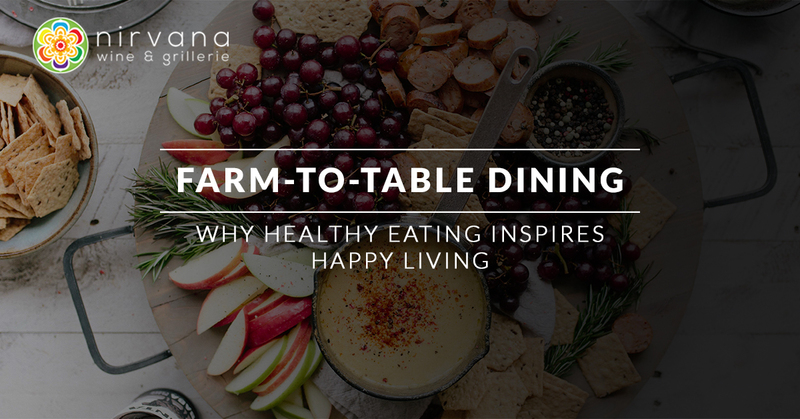 In today’s post, we’d like to explore some of the incredible benefits you’ll gain from farm-to-table dining created with fresh and nutritious foods. As most of you are aware, the farm-to-table movement has swept the country over the last several years. Healthy eating with a focus on sustainability continues to grow in popularity as more and more people recognize the amazing advantages of joining the farm-to-table movement. However, while many view this movement as simply a trend among restaurants and wineries, it is more of a lifestyle which encourages healthier living and environmental sustainability everyday. Please continue reading below. It’s no secret in this day-and-age that the benefits of eating delicious, fresh foods greatly outweigh those of eating processed or frozen foods. And while you can easily pick up healthier foods from your local grocery store, eating local, hand-grown produce, and locally-raised, hormone-free, poultry, beef, and seafood is advantageous to your overall health and well-being. Eating farm-to-table foods either in your home or at scratch kitchen, such as ours here in Vernon Hills, means you’re eating fresher foods that haven’t traveled hundreds or thousands of miles to reach you. Because these foods are grown locally, there is less of a chance for spoiling, and the need to freeze these foods is reduced, as they can be cooked and consumed fresh on a daily basis. Because you’re not eating foods that have spent time stored in a commercial freezer, you can rest assured that you’re getting the greatest nutritional value out of your fruits, veggies, and proteins. Additionally, fresh foods equate to more flavorful foods which can be prepared in the comfort of your home, or by professional chefs at your favorite local farm-to-table restaurant. What’s more, diners gain peace of mind in knowing that the delectable foods you’re enjoying at a scratch kitchen, like our own, are made with the freshest ingredients daily, which also means you’ll consume a wider variety of hand-crafted, sensory-pleasing dishes. If the health benefits of eating locally-produced foods are not enough, consuming farm-to-table foods has a positive impact on the local economy. While it may seem as though the only ones who benefit from the local movement are those farmers and restaurants directly involved, this is simply not the case. Rather, as more money is invested in businesses, local farms, and family-owned wineries, that money goes right back to local communities who experience a positive increase in the need for labor, production, and consumption. Why is this you ask? Well, when foods are transported from hundreds of miles away, it simply doesn’t benefit local farmers working hard to provide their local community with fresh food choices which aren’t produced by corporate farming. Additionally, purchasing from local farms helps keep costs down, which makes healthy eating more affordable for everyone in the community. What is more, farm-to-table dining fosters community engagement with local farmers and family-owned wineries, while also creating a local culture which appeals to tourists who contribute to local economies. When you really think about it, It’s a win-win for everyone! Farm-to-table dining also encourages environmental sustainability in a number of ways. For one, local foods are not transported hundreds or thousands of miles, which means a reduction in the use of fuels because there are less diesel semi trucks on the road releasing harmful carbon emissions into the atmosphere everyday. Also, local farmers and ranchers often try to avoid using gross chemicals altogether, using little-to-no pesticides or hormones, opting instead for organic farming which is healthier for humans and for the earth, too. As far as seafood goes, many local fisheries are turning to either wild-caught or sustainably-farmed fish and seafood which takes into consideration the long-term vitality of lakes, rivers, and oceans. Farm-to-table dining supports sustainable fish and seafood harvests that will not deplete these bodies of water of consumable fish species, thus supporting the livelihood of these vital ecosystems. Along with the human and environmental advantages of the farm-to-table movement, the welfare and treatment of animals is greatly impacted and improved. Unfortunately, giant, profit-driven agricultural corporations often sacrifice the wellbeing of animals for profit. While there have been significant strides taken by many corporate farms to treat their animals better, many companies continue to allow animals and livestock to live in awful conditions, while pumping them full of hormones to increase profits. On the other hand, local family-owned farms treat their animals better, allowing them to move about freely, rather than keeping them cooped-up in a cage. Additionally, many local ranchers pride themselves in providing local farm-to-table restaurants, such as Nirvana Wine and Grillerie, with grass- or grain-fed, hormone-free poultry, beef, and pork. Therefore, farm-to-table diners can enjoy peace of mind in knowing that the farm-raised animal proteins in which they consume were treated well. At Nirvana, we want to provide you with a long-lasting experience that blends pleasurable wines from family-owned wineries with exquisite flavors found in our fresh, from-scratch dishes, and delectable desserts. We believe that farm-to-table dining is a wonderful way to enjoy tasty foods made from fresh, local ingredients daily, which also encourages healthy, nutritious eating, environmental sustainability, the health and wellbeing of farm-raised animals, while supporting local farmers and the local Vernon Hills economy. Find your nirvana by visiting us at our Vernon Hills wine bar and grillerie for a most memorable dining and drinking experience.